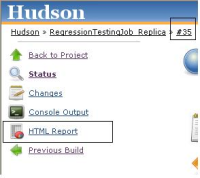 In Hudson, we use HTML publisher to archieve the reports. 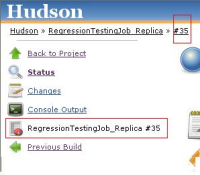 Whenever the Hudson is re-started (Server reboot) , the reports link shown on the builds within the job are getting de-linked and showns "Jobname - #BuildNumber"
Snap shot is attached for your reference.. Thanks so much, I've tested and committed the v2 patch and will release it in the next version, at least fixing this for future builds. Since the reports for previous builds are still there, I wonder if there is a way to restore them? mcrooney added a comment - 2010-05-10 14:10 Thanks so much, I've tested and committed the v2 patch and will release it in the next version, at least fixing this for future builds. Since the reports for previous builds are still there, I wonder if there is a way to restore them? thanks a lot for your help. I've upgraded to plugin version 0.3 now (Hudson 1.358). With that, upon report creation, I get Java errors on the Hudson console now. The reports are created, though. It would be best to open up a new bug for that please, thanks! mcrooney added a comment - 2010-05-19 10:59 It would be best to open up a new bug for that please, thanks!